When my brother was little (long ago and not far away), he would lull himself to sleep by reciting the phrase on an antique cross-stitched sampler of a house which hung on the wall over his bed: “Let me live in a house by the side of the road and be a friend to man.” This simple sampler makes me think about how many things change yet remain the same in my neighborhood. I have come to understand that my family history is intrinsically linked to the houses my ancestors built as well as the area in which they built them, two inseparable elements which complement each other, and which provide fodder for my “family stories.” However, neighborhood nuances can’t be found in official documents. Later census records list household members with street addresses, but no census gives obvious revelations as to the character and personality of the people or their neighborhoods. We travel past historic places every day without really seeing or thinking about them or their builders. My Old House where we grew up sits by the side of the road (a bit too close according to some realtors). Our ancestor, Asa Williams, a Revolutionary War veteran, finished building it in 1789 on something less than a road. Old maps show the most traveled path was along the riverbank, a few hundred yards east of the house. Eventually travel to the settlers’ houses along the high side of the riverbank created the road more or less in its current location, subject to the evolution of contemporary vehicles (horses morphed into gravel trucks, thank you Henry Ford). Many of those houses still stand, including my great-great-great-great-grandfather’s 1789 house next door, and many are occupied by descendants of the original homeowners. Many of the family names on early maps, tax records, town records, and church records are the same names on mailboxes on this road today – Church, Cony, Williams, Saunders, Fisher, Fletcher, Sawtelle, Howard. From personal stories, old local histories, diaries, and the odd manuscript, I’ve found that this is a neighborhood of centuries of families interacting, intermarrying, interweaving, and maintaining its history in the midst of change. Asa Williams was a founder of the first Meeting House and the appointed tythingman. He was nearby in July 1806 when Capt. James Purrington did his Lizzie Borden thing to his wife and six children, not far from My Old House. Midwife Martha Ballard lived nearby and was a frequent visitor here. Nephew Reuel Williams became U.S. Senator Williams. Great-nephew Seth Williams became a distinguished Civil War Union general. Charles Saunders grew plums in my backyard, and Lora Packard Saunders, a great-great-great-great-great-great-granddaughter of John and Priscilla (Mullins) Alden, sold the property to her cousins, my parents. My father remembered a few members of the Passamaquoddy tribe traveling by in the 1930s, offering to help on the farm in return for a few dollars or a few meals; they never left empty-handed. The fishmonger of my childhood came by in his truck, the bed of which was filled with cracked ice and loaded with his day’s catch; he always left with less. In 1946 two young men from Indiana spent the summer bicycling to Maine where they shingled our house roof and played catch with my brother (they took a bus home!). The Fuller Brush man came to the house for his entire 50-year career, selling products to three generations of my family. My father was the milkman who met my mother when he delivered milk to her landlady. Today, the milkman, the fishmonger, and the itinerant workers have given way to box stores and the internet, and the Fuller Brush salesman has retired. These were some of the famous and infamous of past times, living and working next to Everyman in the neighborhood and community. Whether they lived in the neighborhood or passed through it, all manner of men and women made up this neighborhood. Now, the “incomers” (as we all once were), be they from other cities, countries, or states, signal a change already underway. Today we have businessmen, city councilors, farmers, retirees, disabled, teachers, writers (! ), and more, law-abiding and not, educated and not, with widely varying ethnicities. The ancestors of these neighborhood people were as diverse as our population is now. However good or bad, foolish or wise, weak or strong, misguided or sensible, our people make families who make neighborhoods who make communities who make a history not to be ignored but to be remembered, understood, and appreciated. Loved how you tied the poem into your subject! So relevant to what’s happening in our politics and society today! As always, an excellent article….but I would expect nothing less from you! Thank you! What a beautiful post- thank you for sharing! You have a beautiful family history, steeped in tradition with deep roots in the one place. It must have been wonderful growing up with such history! I would add that the Dugan Bread man came to our house. He had wonderful pumpernickel. I had completely forgotten about the Fuller Brush guys. Thanks for rekindling a memory. When I read the names you listed along your road and then also saw Martha Ballard’s name I knew you must be writing about the Augusta, Maine, area. Nothing much changes in Maine, some people come, and some people go, but our roots are deep and we always seem to gravitate ‘home’. My roots in Maine go back to the 1760s on Mount Desert Island and Barnstable and Eastham, Massachusetts area before that. Great post. Some of the names you mentioned started sounding familiar, and then you brought up Martha Ballard. My 5x great grandparents were Elisha & Mercy (Whelden) Mathews. Ballard recorded that the couple “had a Son Drowned at his (Elisha’s) Logg Landing as they were rafting Loggs” on April 23, 1790. The Mathews lived in Sidney, Kennebec. Their grandson Eben, Jr. married Roxanna Snell, a 4x great grandchild of Alden & Mullins. Wish I could see some of the old homes up there. Thank you, Jan, for your lovely post. In my childhood neighborhood we had (as well as the milkman) the bakery, vegetables, insurance, soda, clothing store, and of course the ice cream man, some selling, some collecting. Even the doctor made house calls. What a difference fifty years makes! Quite wonderful! I keep wondering if I am just being fanciful or is there really a special feeling that comes with walking the roads of our ancestors and being in their homes. As an army brat, my roots came through people. I grew up visiting grandparents in Arkansas and California. More family stories came from my California trips so that home felt more like home. Now I live in the house my grandfather purchased when he retired from the army after WWII. I have pictures of the changes made through the years and I did the surprisingly short genealogy of the property which was not patented until 1889 though it had been logged earlier. Good post! The only family home I am aware of that is still standing is my paternal grandfather’s childhood home in Binghamton, NY, which is now a bed and breakfast. Brings back memories of family stories of “the old days”, when people bartered with each other. During the 1930’s, my maternal grandparents had a couple of wanderers appear every spring to help around their property in exchange for meals and a place to sleep; they would disappear in September only to return the following spring. 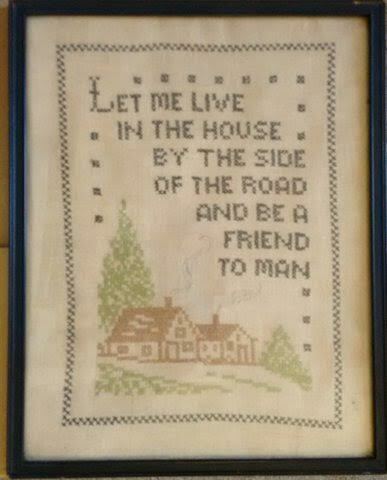 I remember my grandmother had this same cross-stitch hanging in her house. The actual poem was my father’s favorite, and I read the complete poem at his funeral a few years ago. The sampler disappeared when my grandmother’s household was broken up; I don’t know what happened to it. Thanks for bringing back a nice memory. This post, Jan, is an inspiration to me! I now am so much closer to quitting researching (51 years is long enough!) and write down this type of story, as you have done, to make the drudgery of documenting, documenting, documenting retreat to the background a bit!!! A big THANK YOU!!! Your Fuller Brush man must have been Raymond Plante – his regular neighbourly visits were often rewarded with purchases from his “suitcase.” Meticulously dressed and groomed, a gentleman and an entertaining conversationalist (with French Canadian dialect). He came to my childhood home, 16 miles north of Augusta (East Vassalboro, Maine). Thank you for this wonderful, timely post! Your special stories are the kind I am writing…the happenings along with the people. The research is so much harder when one doesn’t really KNOW how things went in the 1630s in Lebanon, Maine. Your story is upbeat. I’m not sure if all was well back then, but from your story one just knows that it was! My grandfather had a route for Borden Dairy in Evanston, Ill, his wagon pulled by a horse named Brownie, before I was born, but we still had “The Junkman” in a horsedrawn wagon in the early 1950’s. I would RUN to pet his horse and give her a carrot; she wore a straw hat with her ears poking out. And there was the knife-sharpener with a pushcart, announced by a loud and distinctive bell. And downtown, near Wieboldt’s department store, an organ grinder with a monkey wearing a red cap and vest. My dad, born 1920, (Hardin County, OH) used to recite this poem to my 3 brothers and me. The framed poem (printed and includes a drawing of a Schnauzer dog) hung in our home my whole life. I now have that treasure. My 3 brothers and I (all in our sixties) can still recite the poem from our memories of Dad reciting it to us. As I reflect, the poem represents our dad’s legacy to us. Thanks for sharing the poem and your inspirational thoughts.